Rising music star Charles Bradley: American politics "hurts me"
Larry King: What do you make of the sudden involvement of Anthony Wiener? Kathy Griffin: OK, well, here's the sad thing. I was actually a Wiener apologist. And I mean that in many ways, not just for Anthony, just in general I was a Wiener apologist. Kathy Griffin: To have wieners. You know, I don't love all of them. I've had good ones and bad ones, trust me. I've been around the block and you know that. More than anybody, probably. And so I actually, believe it or not, back in the day I liked him as a congressman. He was very passionate. And now, I mean, you've got these two women who both have to deal with the baggage of the dudes. They're both so smart, so qualified. Once again, to me as a voter, the Anthony Wiener thing has nothing to do, certainly, with Hillary. But it doesn't even have anything to do with Huma Abedin, although now she's a household name. I've met her. I could put her in my next book. She seems very smart and knowledgeable. Larry King: She is, she's very smart. 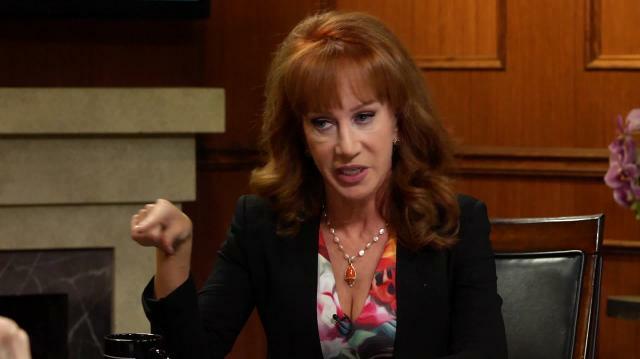 Kathy Griffin: Yeah, she's super duper smart. Larry King: What do you make of Anthony Wiener? Kathy Griffin: I think he's a guy that has a proclivity that is something more serious than anybody knew. And people are very complicated. Larry King: Did you know anybody like that? I never knew anyone. Larry King: That did that. Kathy Griffin: Yeah, I knew a guy that actually went to prison for pedophilia. And I truly would never have known that about him. And he was a guy that was, he did very well in other areas of his life. And I think there are people like that who are able to compartmentalize in a way that, I can't psychoanalyze, but I would imagine that that is his deal.And he has a set of his mind where he used to be a congressman, and he wanted to be mayor and he came fairly close, and then he's got this other side that supersedes all of it.